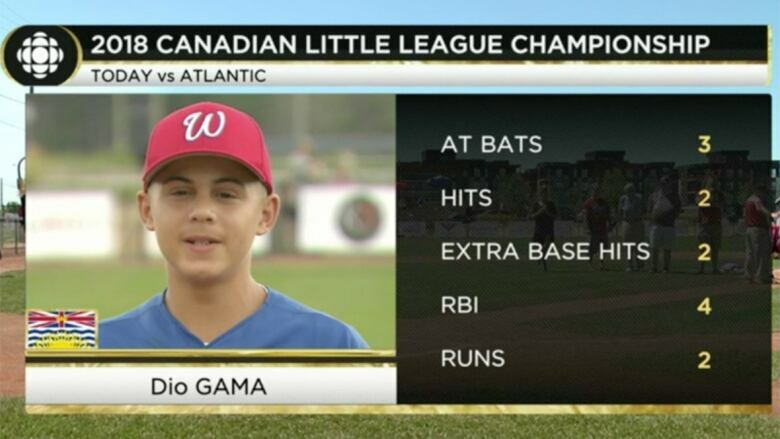 Dio Gama was a big reason why the team from Whalley, B.C., won the Canadian Little League title last week. But now a family immigration problem may prevent the 13-year-old from fulfilling his lifelong dream of playing in the Little League World Series. 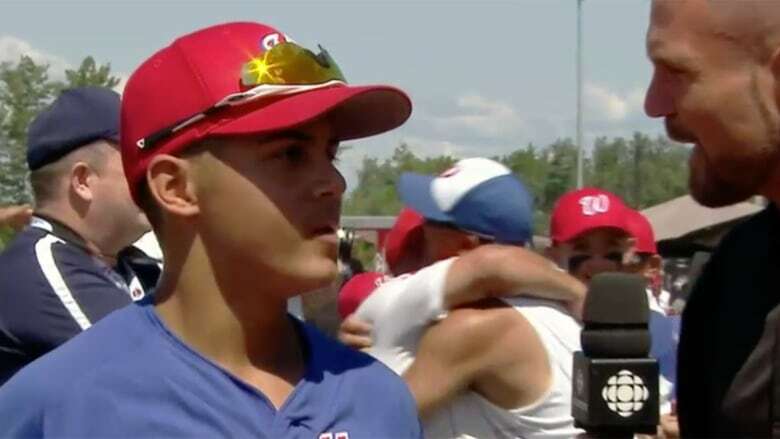 As the other young baseball players from Whalley, B.C., ran to each other on the diamond to celebrate their national Little League championship victory Saturday in Mirabel, Que., Dio Gama raced to his father. Both dad and son realized the bittersweetness of the moment. Tears streamed from the 13-year-old boy's eyes as he hugged his father, Noe Gama, because he knew he wouldn't be travelling with his teammates to the Little League World Series this week in Williamsport, Pa.
Dio Gama, who was born in Las Vegas to Mexican parents, has lived in Canada for three years. His parents have been seeking refugee status in Canada for more than a decade, but the family's case remains in legal limbo after a federal judge ordered a review of their case last month. The process has been complicated by the fact that Noe has previously been denied status in Canada. In 1997 he was convicted on a drug charge in the United States. Under a plea agreement, Noe received a 60-month prison sentence and agreed to deportation from the U.S. He was transferred to a Mexican prison to complete his sentence and was released in 2001. In 2008, Noe first arrived in Canada with a visitor visa and claimed refugee protection. The family hoped its case would be resolved by now, but just days before the national championship game, the family got a letter from its lawyer saying the application was still pending and advising that Dio should not leave the country because there was a chance he wouldn't be allowed back into Canada. The team left Sunday for Williamsport without Dio. "This has always been my dream, to play for Canada at the World Series," Dio said before boarding his flight back to Vancouver. "I was playing the national championship like it was my last game with my team." Dio kept it all a secret. He didn't tell his coaches or teammates he wouldn't be able to fulfil his dream of playing in the Little League World Series if the team won the Canadian title. Still, with all that weighing on him, Dio turned in his best performance of the tournament in the championship game. He hit two triples and drove in four runs to help Whalley to an 11-0 victory over Glace Bay, N.S., that earned them a spot in Williamsport. "I had a great game," Dio said. "I had fun and I'm happy about that because I knew it was probably my last game with my team." His father watched every second of the game from the stands in Mirabel and was emotional throughout. "He's torn into 100 pieces," Noe Gama said of his son. "As soon as the game was over he came to me and started to cry. It's so difficult for him and me." As soon as the celebration ended after the game, Noe approached Whalley's head coach, Mike Marino, to share the news with him. "We were devastated," Marino said from the team bus travelling to Williamsport Sunday afternoon. "Not only is he a leader of the team but he's a great kid. He was devastated. We all are." Marino says Dio joined the team this past year with the hope of helping them get to the World Series. Because Dio is 13, this was his last chance of getting to the prestigious event. Marino felt the poise the young player showed in the championship game, considering the circumstances, was remarkable. "It shows courage, maturity and a sense of belief in himself. He may be 13 but acts like at 17- or 18-year-old." The team is trying its best to get Dio to the World Series. Marino says they've written a letter to Canadian Prime Minister Justin Trudeau explaining the situation and are also contacting other politicians. "We're doing everything we can right now. We want to get him flown in for the World Series," Marino said. Dio is still holding out hope he can be part of his Canadian team in Williamsport. "I appreciate what everyone is doing right now," he said. "This has always been my dream." Devin Heroux reports for CBC News and Sports. He is now based in Toronto, after working first for the CBC in Calgary and Saskatoon.